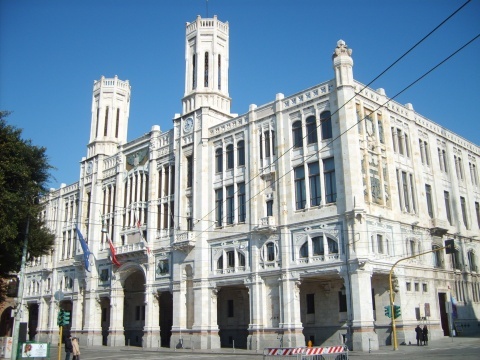 The Palazzo Civico of Cagliari is the municipal seat of Cagliari. The building is located in Via Roma, in the lower part of the district of Stampace. The former Town Hall, located in Castello district, was the municipality seat until the end of the nineteenth century. In 1896 the City Council decided to move the Town Hall to via Roma, in the area that overlooks the harbour. The building was inaugurated in 1907. The losses caused by bombing in 1943, were so serious that it took several years to restore the building to its original appearance. The building, made of limestone, it's a perfect combination of Catalan-Gothic style visible in the porch, and the Art Nouveau of the facade. The main facade has seven arches, in addition to the central one, nine metres high, through which we reach the inner courtyard of the palace. The facade is completed by two octagonal turrets, thirty-eight metres high, while in the corners of the building stand out four obelisks, decorated with the carved heads of “Quattro Mori”. The facade is adorned with various bronze sculptures including an eagle, placed in support of the emblem of the city, two lions on the main facade and the works that symbolize the Agriculture, the Trade and the Industry. In the “Sala Consiliare” (Council Room) there are three huge paintings by Filippo Figari, made between 1916 and 1924, respectively representing the vicar of Pisa with the Archbishop of Cagliari, Vittorio Amedeo II of Savoy and a group of kneeling Moors. The “Sala della Giunta” hosts some paintings by Marghinotti and a retablo of the councilmen by Pietro Cavaro. The “Sala dei Matrimoni” (Weddings Room) houses a painting by Figari. In this room, inside glass cases, there are jewels, archaeological finds and the seventeenth-century statue representing St. Augustine. The “Sala del Sindaco” (Mayor Room) hosts a large Flemish tapestry, made in 1620 by Franciscus Spierink. Finally, in the “Sala Sabauda” (Savoy Room), there are three paintings by Marghinotti: two official portraits of Carlo Alberto and Vittorio Emanuele II, while the third shows the arrival of Carlo Alberto in Cagliari in 1840.